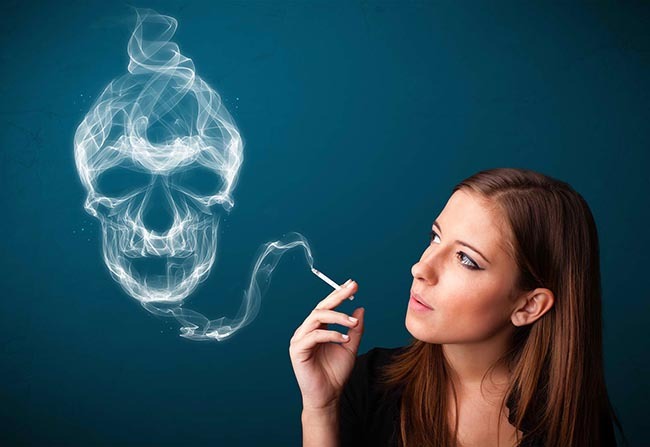 Dangers Posed By Smoking -- Everybody is aware of the dangers of smoking. It is absolutely damaging to the human body. While carcinogens in cigarettes pose a hazard to everyone, women are three times as likely as men to get aggressive forms of lung cancer and more likely to develop it at an earlier age. Women are also more likely to die of lung cancer than breast cancer. Quitting smoking is easier said than done. And women, it turns out, have an even harder time quitting than men. Stronger withdrawal symptoms may be attributed to hormones or the bigger nicotine dose absorbed by smaller female bodies. Regardless of women's age, the dangers of smoking contribute to infertility, anxiety, blindness, and osteoporosis. Pregnant women who smoke risk not only their health but their babies' as well. Second hand smoke affects the children and other people around mothers who smoke. Smoking is a vice that almost always begins during adolescence. When teenagers finish from high school without ever smoking regularly, they probably never will. However, while boys and girls are equally likely to start smoking, the latter get the worse health complications. Young people may exhibit symptoms of addiction within a few days or weeks right after they started smoking. While cigarette smoking was rare in women during the beginning of the 20th century, the tobacco industry realized the potential of women as a market for the expansion of the cigarette industry. In fact, tobacco companies launched the campaign slogan “Instead of a sweet, reach for a smoke” to encouraged women to smoke so as not to gain weight. This was followed by “You've come a long way, baby” as a tribute to the burgeoning women's liberation movement. These marketing campaigns not only depicted women smokers as beautiful, independent and fun, but also sent subliminal messages that smoking helps women control their weight. Cigarette ads are banned in kids and teens magazines but billion of dollars are spent on t.v., billboards, and adult magazines which can easily be accessed by the youth. Since 1987, lung cancer has surpassed breast cancer as the leading cause of cancer deaths among women in the United States. About 87% of all lung cancer cases in America is directly attributed to smoking. Smoking causes heart disease, which is the number one killer of women in the U.S. The dangers of smoking contribute to respiratory diseases such as emphysema and chronic bronchitis, as well as many kinds of cancer. Women who smoke also harm their appearance as smoking speeds up the aging process and produce more facial wrinkles, gum disease, dental decay, and halitosis. Mental health is also affected due to depression and anxiety disorders. Women are more likely to be depressed than non-smokers, and that women with anxiety disorders are more likely to smoke. Some women, however, are finding creative ways to break the habit for good. Engaging in activities where smoking wouldn't fit, such as exercising, biking, mountain-climbing, as well as turning to a non-smoking lifestyle that includes going to smoke-free places with your kids. The dangers of smoking for women has increased attention and awareness from women's organizations, resulting in a number of projects that focus on supporting tobacco cessation efforts specifically for women.